The 100X Speedy Protein Gel Stain is a fast and sensitive fluorescent dye for visualization and quantitation of proteins separated by 1-D or 2-D SDS-PAGE. It comes as a 100X stock solution that is simply diluted with water by the user to its working concentration. The 100X Speedy Protein Gel Stain is normally low fluorescent but emits strong fluorescence (bright golden color) as bound to proteins. The staining procedure is a simple two-step protocol (fix and stain) that can be completed in as little as 30 minutes. Gels to be stained are fixed with ethanol/acetic acid solution prior to staining with 100X Speedy Protein Gel Stain Kit. A destain step is not normally recommended, but may be employed to reduce background, simply by agitating the gel in water for 1-5 minutes. Gels stained with 100× Speedy Protein Gel Stain Dye may be directly visualized with a variety of different UV-based fluorescence imaging systems. The maximum emission wavelength of protein-bound the dye is near 570 nm. It gives exceptional sensitivity and wide dynamic range for protein detection. 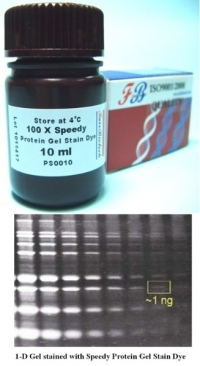 The bound 100× Speedy Protein Gel Stain Dye is easily removed from the protein by immersing the gel in sufficient water, thus it is well compatible with subsequent enzymatic digestion and mass spectrometry for proteomics applications. Stained gels may be stored in stain solution in the dark at 2-8°C; imaging sensitivity might be moderately enhanced after 4°C storage of the stained gel. Stored at 2-8°C and protect from light.